How much food do you need at your party? Are you catering for a crowd, or hosting an intimate evening soirée? Either way, there’s a fine line between leaving your guests hungry for more and being left with wasted food. How many options should you provide? What about vegetarians? Will everyone’s appetite be satisfied by the end of the evening? Food is a vital part of any party or celebration, so make sure yours is remembered for all the right reasons. From sizzling smells and spectacular sights to the exquisite tastes of a well-planned menu, here’s how to get that delicate balance just right! If you’re working with a caterer, they’ll be able to provide a ‘tried and tested’ way of deciding how much food you’ll need. For a sit-down dinner, there’s not too much to think about in terms of quantities. Bowl food or nibbles with drinks need to strike the right balance between leaving guests with rumbling tummies and ending the evening with lots of leftovers. Type of event – is your party food simply nibbles to go alongside drinks in the evening or something more substantial? Time of event – if you’re hosting an all-day event or a party over a typical meal time, your guests will expect you to cater accordingly. Mix of guests – is it an adults-only event or will there be children? Different guests will have different appetites and tastes. Once you’ve decided on the style of the food you’ll be offering, whether it be a fun and friendly barbecue running throughout an all-day outdoor event, or sophisticated canapes to serve alongside cocktails during an elegant evening do, you can start to think about quantities. When hosting a dinner party, banquet or large event at which a meal is expected, such as a wedding reception, menu planning is vital. You’ll need a starter, main course and dessert for each person, as well as coffee for afterwards, not forgetting to cater for special dietary requirements and children if applicable. Ask your guests to let you know in advance if they have any particular needs. Unless it’s a small dinner party at your home, most people leave the catering for events like this to the professionals! Your hired venue or caterers will give you menu suggestions – make the most of their experience and expertise and let them recommend dishes that will work well for your event. Parties which include grazing food in place of a meal need to offer a good variety of foods for guests to choose, including bulk options to keep larger appetites satisfied. This is a great way to cater for parties where you want to keep your guests mingling. Bowl food and small canapés can easily be eaten while standing. The more options you have available, the less of each you need to provide. Think about which items are likely to be most popular and stock up on those. If you’re hosting pre-dinner drinks, post-dinner cocktails or a late evening party, food doesn’t need to be so substantial. Expect the average guest to need approximately 4 items during the first hour, and 2-3 items per hour after that. If you’re unsure, it’s always better to round up your quantities than let people go home hungry. Everyone loves a sweet station! Don’t forget to include some non-savoury items amongst your menu. If you have a centrepiece dessert such as a wedding cake you should allow for all your guests to have a slice. Mini desserts are a great option if you want to provide a choice – allow 2-3 small pastries or petit fours per guest. This is where it’s important to consider the type of guests you’re inviting when working out quantities: cake is a vital aspect of a children’s birthday party, for example, whereas a guest list mainly made up of adults is more likely to favour savoury options. When planning your food, think carefully about the way it will be served and how this can affect the amount people eat. Guests may be liberal about how much they take if your platters are piled high, but smaller items arranged with an attractive garnish look more elegant and people tend to be more conservative. If you have waiters to serve canapés throughout your party, you won’t need as much as if food stations are unattended for guests to load their plates. Looking to create a stunning and memorable centrepiece for your party? Why not combine food and entertainment with a live cooking station, wowing your guests with a professional chef preparing food in front of them! Or, set up food stations around your venue with a different theme for each, such as pizza, fruit, cheese and crackers, sushi, sweet treats and more. Getting the balance right when it comes to food is tricky. 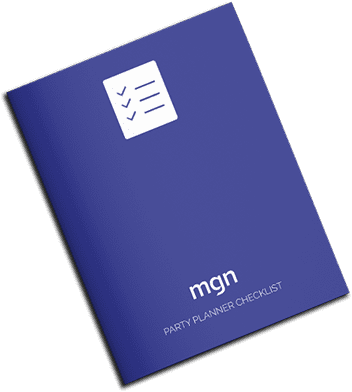 When you’re working with a party planner or events organiser, take advantage of their ideas and experience in planning your menu. Whether you’re opting for simple and straightforward party food or something classier like gourmet canapés, no host wants to run out mid-celebration.